As a child, I was a sleepwalker. They tell me I would be found curled up, asleep, on the fuzzy rug in the bathroom, like a cat. I also talked in my sleep, although it wasn’t until I had a roommate in college that my words were captured for posterity. Profound things like: “Chop, chop, chop the nuts.” and “Somewhere there’s home and I’m going.” From childhood through my 20’s I remembered my dreams some of the time, but never really paid attention, so the images and feelings would slip away quite rapidly upon awakening. Then I met a woman who was really ‘into’ dreams. She wrote detailed descriptions of her dreams every night, often several dreams, filling pages and pages, which obviously took some time. I began to ‘attend’ to my dreams more and suddenly they were more vivid and my recall was much more complete. This is a truism about dreams and dreaming. If you express interest in them by writing them down, even the briefest image or lingering feeling, or if you simply place paper and pen beside the bed with the intention of capturing dream stuff, your dreams will respond by being more present. Another truism is that we do all dream, virtually every night. But there are so many environmental factors that interfere with experiencing and then remembering dreams that many people believe they do not dream. I’ve had the opportunity over the years to prove this point to many disbelievers, so I feel pretty confident about that assertion. But I am getting a bit ahead of myself. I began reading about dreams and dreamwork, Carl Jung being a true visionary (oops, pun, or not) and prolific writer in this field. I also experienced and practiced guided dream reentry, which is surprisingly powerful. Eventually, I started a dream group with two other women. We met every other week for about ten years. That was an amazing time, writing and sharing our dreams and then sharing questions and insights that arose. I found that I had the capacity to suspend my own thoughts and just let the images of someone else’s dream enter me and stimulate insights. Okay, I am sounding sort of wacky again, but it was true. I think the other women in the group would still agree. So, it came to pass that I taught classes in dreamwork in a few different settings and in each one I learned more about dreams. I was teaching English in a small alternative high school, with students who had troubled histories (and present lives as well.) Run-ins with the law, time spent in institutions, substance abuse and mental health issues were the norm. So, I offered an English class on dreamwork to these ‘unmotivated’ learners. We had a blast. At first they referred to the class as ‘kindergarten’, because I would close the blinds, have them lay on the floor and take them through guided visualizations. Then they would write, in class, about what they had experienced. Sometimes I would give them art materials like crayons and paper or modeling beeswax to recreate images from their excursions into the unconscious. There were never images of gratuitous violence. I think they were as surprised as I was by the ‘material’ that came out. A few of them began writing down dreams at home and we incorporated those into class work. Several of these young men and women had never read a book in their lives. Most did not write, or read their work aloud or own up to their ‘dreams’ of any kind. Each one of them broke through some barrier over the course of the semester. I can’t say if it was life changing for them, but it was for me. I went from that job right into grad school for education. A few years later I had a chance to teach a similar course to college students at a local university. (Full disclosure: it was the same one where I had previously learned drafting on-the-job and also my undergrad and grad school alma mater.) These students could not have been more different than the rough, street-wise kids from the earlier class. But in spite of their privileged status and education, they were just as skeptical about dreams and dreamwork. And they were slowly won over by the experiments I forced them to make: journal by the side of the bed, writing down & sharing dreams, crafting images from their dreams and experiencing dream re-entry. With just a couple of exceptions, these undergrads had suspended their disbelief by midway through the semester. The course got very touching evaluations, from these future engineers, doctors and mathematicians. I guess I should say what a privilege it is to hear about people’s dreams; in classes or privately. I’ve worked with many friends (and some paying clients) on their dreams over the years and I’ll be darned if there isn’t something for me in each experience. Call it the collective unconscious or what ever you like, there’s something there. When I led a three-session workshop on dreams at a local ‘New Age’ bookstore, I encountered a participant whose input stunned me at the time and still has me puzzling. She was blind. She called me on the amount of visually based language I used when speaking about dreams. And she was right! I began to learn from her about the dream experience of a visually impaired person and if I were inclined toward research or an advanced degree, I might follow that path. As it is, my dreamwork life has, with so many other Sparks that I have Truly loved, been on hiatus while my real life took over all the space. 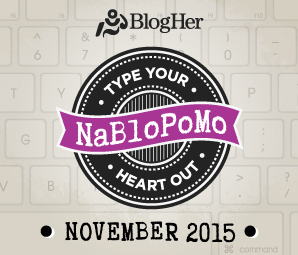 This NaBloPoMo writing is certainly stirring up some old passions. Once they are unearthed, I will have the opportunity to Truly Triage and live intentionally, re-incorporating these Sparks of joy into my life once again. This entry was posted in Creativity, Family, Friendship, Writing and tagged dreams, dreamwork, NaBloPoMo 2015 by Assembling a Cooking Life. Bookmark the permalink.